Avast ye, casino adventurers! Dr Slot has decided that it’s a pirate’s life for him, and he’s inviting you to join his seafarin’ crew to sail the seven seas in search of serious treasure! Do you have the heart to swashbuckle your way to a big win? You’ll soon find out when you play Lucky Moon Lagoon mobile slots! Legend has it that Lucky Moon Lagoon is the secret location of the biggest cache of buried treasure any pirate has ever laid his hands on, so that’s where we’re heading! If you have a device running iOS 10 or Android 5.0 and above, you have all the qualifications you need to join Cap’n Slot’s salty crew. Just bring your best pirate hat, and a parrot if you like, and join him on his most arrrrrrsome adventure yet. Right then you salty dogs! Before we can set sail, you’ll need to set your total bet. This is always your bet-per-line multiplied by the number of win lines you choose to play on. To change your settings, tap the ‘Bet/Lines’ button in the bottom left corner. There are 15 win lines in total, so use the ‘+’ and ‘-’ buttons to select how many you want to sail across. Do the same with your bet-per-line, which can be anything from 2p up to £20. As you change those settings, your total bet will adjust automatically in the box above. Ready to yell ‘anchors away’!? Either press the white floating arrow to spin the reels, or, if you’re one of those pirates with hooks for hands, you may want to enable the Auto Spin feature to do it for you. You’ll find the ‘Auto Spin’ button in the ‘Bet/Lines’ menu. Press it to activate Auto Spins, choose the number of spins you want and enter a minimum credit level that you don’t want to go below. You can also set Auto Spins to stop if you have a single win exceeding a pre-set amount. When you’re ready, press the white arrow button to begin, and press ‘Stop’ at any time to return to manual play. Successfully sailing a pirate ship into those Lucky Moon Lagoon coves is no easy task, but Cap’n Slot will take care of that! All you need to remember is that win lines always pay from left to right, and you can play in either landscape or portrait mode, just by tilting your device. When you’re ready to begin, hit that white floating arrow button to spin. When the reels have spun and stopped at random, it’s time to find out if you’ve won any pieces o’ eight! To do that, you’ll need to have lined up enough matching seafaring symbols on an active win line. With some, you only need to get two matching symbols for a win, while others require a minimum of three. If you’ve plundered a win, those winning lines will come to life on the screen, and the amount you’ve won will go into your credit chest for safe keeping. Every time you spin in a winning combination, the treasure you receive as a reward will be a multiplier of your original bet-per-line for that spin. Certain symbols are worth more than others, and lining up more of them will earn you a higher prize. To see full details of what each winning combination is worth, navigate to the three horizontal lines in the top left corner and then select ‘Paytable’. When it comes to the pirate’s code, some things are definitely rules and not just guidelines! For example, you can only win once on each individual win line, so only the highest value win on a single line will count. Good news though! If you pillage a win on more than one line in a single spin, we’ll add up all of those prizes to give you a bigger total haul! The skull and crossbones symbol may strike fear into the hearts of landlubbers everywhere, but for a seasoned pirate like you, it can only be a good thing. The skull and crossbones Wild symbol can stand in for almost any other symbol on the reels, so it could turn a losing spin into a treasure-grabbing opportunity. For example, if you spin in two As on an active win line with a Wild alongside, the Wild will act as a third A and secure you a win. Wilds can’t substitute for free spins or mini-game symbols though, and you can’t win the progressive Jackpot with a Wild symbol on your win line. You can only do that with FIVE matching ‘Lucky Moon Lagoon Jackpot’ symbols. Cap’n Slot’s fiery-haired First Mate may look a bit threatening, but he’s actually a great guy! If you see two or more symbols featuring his fearsome face, anywhere on the reels, you’ll get to play The Golden Dagger bonus game! You begin deep inside one of Lucky Moon Lagoon’s many caves, with a ship packed full of loot! All you need to do is spin the wheel and sail towards daylight to escape with the treasure. Your pirate pal will stop the wheel at random using his lucky golden dagger, and whichever number it stops on is how many spaces you get to move. The closer you get to the exit, the more money you’re likely to win! Keep spinning to sail through the cave and you’ll win each multiplier you land on. If you make it to the very end, you win the top prize! If you land on a ‘Collect’ space, you’ll collect any multipliers you’ve won so far and return to the reels. 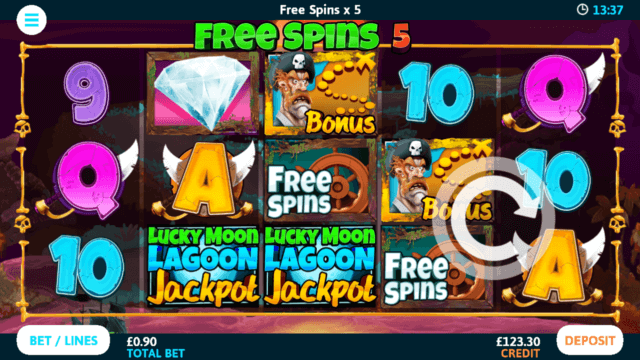 Your pirate ship’s wheel is your Lucky Moon Lagoon Free Spins symbol, and it could steer you towards some serious wins. If you line up 3, 4, or 5 Free Spins symbols on an active win line, you’ll get 5, 7, or 9 free spins respectively. When you enter free spins mode, your bet-per-line and number of win lines will lock to the values of your last paid-for spin. Cap’n Slot will pay for the cost of those spins himself though, so they won’t affect your credit. How much treasure will you plunder with your free spins? If you’re new to Cap’n Slot’s crew, you can also earn yourself a welcome bonus of up to 120 free spins and up to £1,000 deposit match across your first five deposits. * Sign up today and find out if it’s a pirate’s life for you! Lucky Moon Lagoon has a theoretical return to player of 94.67%. This is based on long term playback.